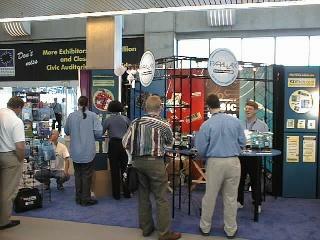 A stroll down the showroom floor at the Embedded Systems Conference always subjects you to so much variety. There are some vendors, like Microchip, Motorola, and Texas Instruments, that always promises to be informative and entertaining. The smaller booths, however, tend often become be a question of indecision as to whether or not you should stop by - sometimes its not obvious that the vendor has anything you may be interested in. But of all the booths there, there was one that I have to point out qualifies as the Coolest Booth. If you were locked on the conference floor overnight, this is the booth that you would spend most of your time at - its the one where you would play with all the demos and just experiment all night. The award easily goes to the Parallax Booth. Parallax makes the Basic Stamp microcontroller project board, which allows you to program Scenix SX and Microchip PIC microcontrollers using the Basic programming language. The products are very popular in small, single threaded, quick time-to-market applications. Parallax had samples of all of their project boards which are in the form of the stuff we all like to play with - robot projects, a weather station, educational boards, lots of cool stuff. The booth was always busy; everywhere you turned, people was playing with something. But most important, most of the projects were educational, something that is sorely lacking in this industry. 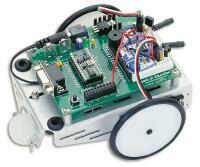 They teach principles of robotics, data acquisition, motor control, and others. Lots of seat-of-the-pants marketing goes on at the Embedded Systems Conference. One thing that was immediately obvious: the semiconductor and 3rd party marketplaces have adapted and embraced the internet rapidly. Datasheets and product literature are readily available from the web sites of most vendors. Samples and datasheets can be ordered online. But while this is certainly a boon the working engineer, in the long run some products will suffer. Without the personal interaction with a sales person or support technician, vendors can easily lose touch with the marketplace and miss market trends or, even worse, the embedded market may evolve more slowly as conventional marketing becomes more difficult. None of this appears to be a challenge to Microchip - I spent a fruitful half-hour with Ron Cates, their product marketing manager, and Eric Sells, Public Relations manager for Microchip. The reason for Microchip's success is that they know their target market engineers so well, they probably know our favorite pizza toppings, a marketing advantage well understood by the most popular 8-bit microcontroller supplier, Motorola (Note: while I did speak with Mot at the conference, we did not discuss pizza). But the internet has really sifted out the good from the bad in the embedded marketplace. The difficulty of separating the good vendors from the bad vendors is less of a mystery now. Public & private web sites, news groups, and email have made it impossible for vendors with troubled products to keep their problems unknown, while the praises of quality vendors are well broadcast to the internet community. The result: No More Secrets.